This is the first time I’ve run a Desert R.A.T.S race, organized and produced by Gemini Adventures. My friend Jesse organized a group of people to come out and run together. We camped on BLM land about 10 miles from the race start. It was my first camping trip of the season, and needed in so many ways. I arrived at our campsite by 5:30pm. Within a few minutes we all piled into the car and drove back to Fruita to pick up packets. The race bibs were cloth, and totally reusable. After finishing the race we were instructed to return the bib in exchange for our post-race meal. My bib was as big as my face; I joked that I could use it as a baby blanket. Other people’s bibs were smaller, the size of a typical race bib. The swag bag was pretty disappointing; the requisite paper fillers were there, along with a Hammer Gel. Some people got Hammer Gels AND a LaraBar sample; some got a plastic container for electrolyte capsules. The t-shirt looked good though. Jesse ate his (small) meal and went back for seconds; the lady was pretty cranky about giving him more, though he pleaded and she eventually caved in. A few hours later I tucked into my tent and tweeted “Cozy in my tent. Relatively warm out, should be fine in my sleeping bag. Alarm set for 4:55am. 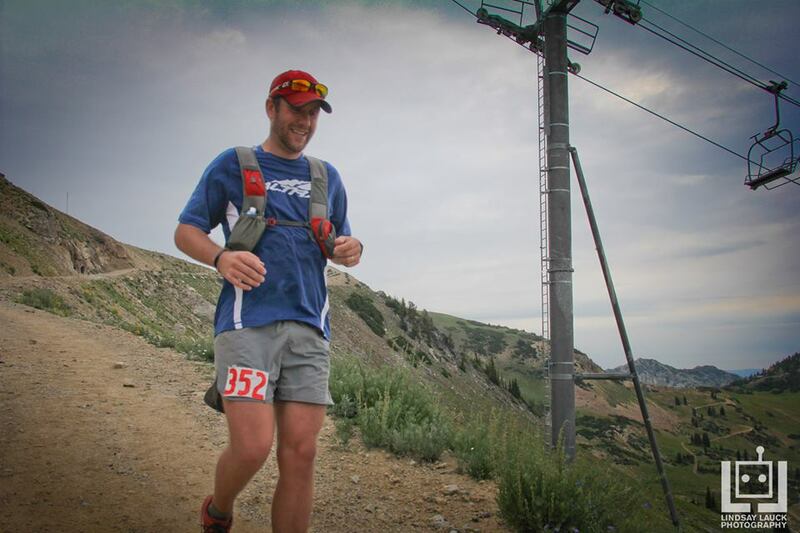 Leave camp by 5:30, 6:30 race start.” My good friend Jeff tweeted back; we discussed a ballpark race time, finally deciding on something between 4:30-5:00 hours based on approximately 4000’ elevation gain, single track and jeep trail terrain. He cautioned against spending too much time at the Aid Stations; I told him I was going to carry my hydration pack that holds 70 oz of water. The plan was to drink all 70 oz by mile 19, refill the bladder at the Aid Station and run hard the last 10k. We arrived at the race right around 6am. The temps were already in the high 40’s and promised to warm even further as the sunlight hit the desert rocks of the Kokopelli trail system. Inside my hydration vest pocket were stashed 5 gels, one for each hour of the run (assuming I ran 5 hours); 2 Clifshot Razz, 1 Gu Roctane, and 2 Clifshot Citrus flavors. I’ve tried the Clifshot Razz before and find it “okay”… a little sweet for my taste. The Gu Roctane came from somewhere unknown, and the Clifshot Citrus flavor was a last-minute pick-up item from the store when I realized I didn’t have time to restock with my preferred Clifshot Mocha flavor or HoneyStinger gels. I woke up 30 minutes before my alarm and lay cozy in my sleeping bag, thinking about what the day would bring. There was no nervous energy or anxiety eating at my stomach, and I enjoyed the pre-dawn quiet as I listened to people quietly move around the campsite, opening car doors and speaking in low tones. Finally I got up, put on my gear and ate half a gluten-free bagel and a banana an hour before race start. The one thing that bothered me was that there was no toilet nearby; I love to poop first thing in the morning and any deviation from this throws my GI track off. Once we arrived at the race, excitement took over and I’ll admit to squealing and jumping up and down while a few friends stood stoically watching my antics. 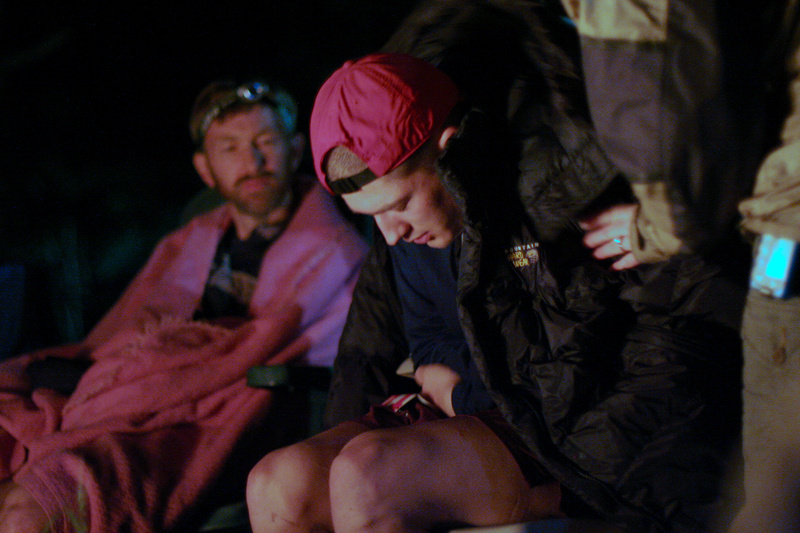 Jesse was cold and didn’t want to unbundle until the last possible minute. I felt frisky in the pre-dawn light and couldn’t wait to get started. The first leg was on jeep trail. It was an easy slight climb, a simple warm-up for the next 5 miles of hills on technical terrain and single track. Within minutes the pack had thinned and I couldn’t see the lead racers anymore. A few people sprinted past, but overall my position close to the front was approximately perfect for the 9:00 pace. We headed up the single track onto sections of slick rock. The sun crested the horizon and cast a warm glow to the sandstone rocks and bathed us in golden rays. The sound of breathing and the smell of sweat pierced my senses; I was jolted into absolute awareness of the mountain and the people ahead and behind. Every footfall had a purpose; each balanced nuance of leaning into a turn or hesitant step was potential disaster if not handled correctly. I focused on the moment and rode the high of being utterly present on the mountain, letting my trained runner’s body do what it does best. Orange tape waved from branches and peeked out from underneath rocks, guiding us through the turns, across dry ravines and up steep inclines. I paused periodically to take pictures of the scenery; I wanted a visual reminder that I was in a gorgeous desert, running a beautiful trail race because I was strong and alive. People leap-frogged each other and were so kind about passing. 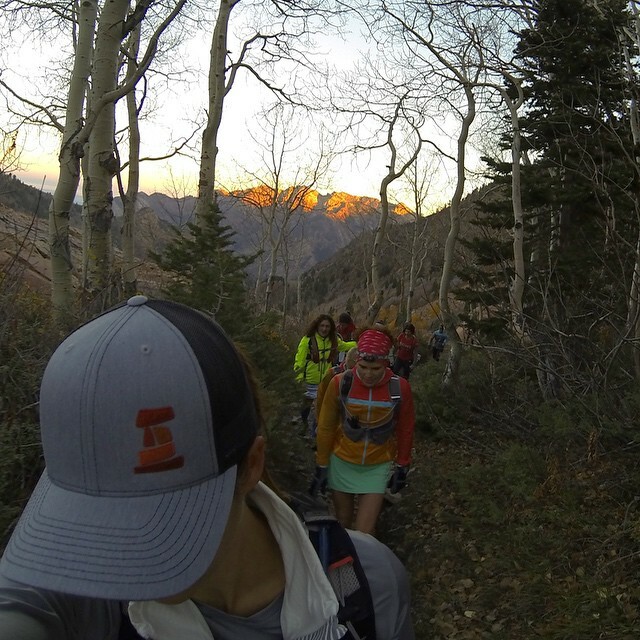 Even though we were on tight single track there was always room to pass if the runner ahead knew your intention. I would call out “I’m coming up behind, can I pass you?” and wait for the response; I never wanted someone to feel like I was going to plow past and throw them off balance. 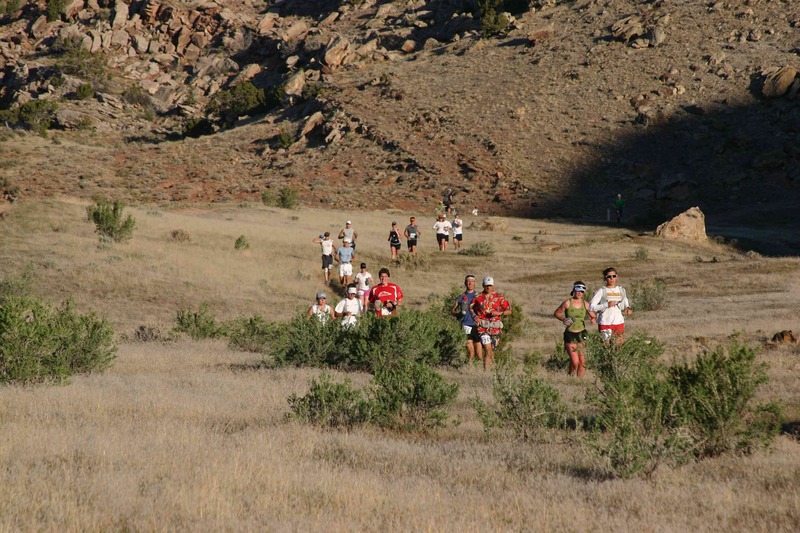 I got the same respect when people passed me; the unspoken etiquette of trail racing was in prime form, making for a completely safe experience during the entire run. Finally I dropped into the first Aid Station, a little table with 2 coolers and an assortment of gels. I checked my Garmin; almost 6 miles in 1:00 on the nose. I was surprised; after doing the math with Jeff the night before, I thought I was going to be doing about 5 miles per hour, not six. This was surprising. I said a mental “Hunh!” and sipped water from my pack. A mile later it occurred to me to eat my first gel. I wasn’t hungry but wanted to be pro-active, knowing that when hunger set in it would be too late to fuel properly. I downed a Razz Clifshot gel and drank mightily to wash away the sticky-sweet taste. The trail settled into undulating terrain. Most of the leap-frogging was over, and I watched the sun hit the Colorado River far below. High rock walls rose from the ground and the dust from the trail gave a little crunch under my feet. 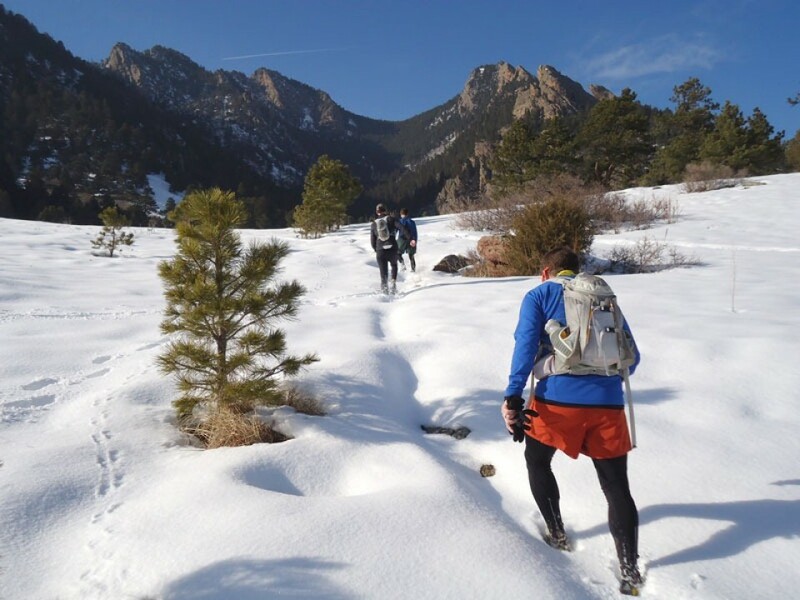 I noticed a few thoughts float like clouds through my brain, but they disappeared quickly when I refocused my attention on the trail in front of me. The time for thinking was over; it was time to remain completely present and respect the race and the terrain I was covering. The next hour quickly floated by. My breakfast and the gel still fueled my body, the air was warm but not uncomfortable by any means, and even though I hadn’t had a good poop in 24 hours my intestines were not achy or roaring to life. Dana and Tina saw me coming at the next Aid Station and set up a cheer that startled the crew workers. They screamed my name from the moment they saw me appear to the time when I finally disappeared around the next hill. I lifted my arms in a “touchdown” mode and gave them a thumb’s up along with a massive smile; it felt good to have someone know that I was there. My spirits lifted and the smile didn’t leave my face for at least the next few mile. I pulled over and peed behind a rock, figuring that I had been running for 2 hours by this time and it was time to let loose a little water. My Garmin said 2:09 for 13 miles. I did a double take at the reading; this couldn’t be right. I was on pace to run a 4:10 race No freaking way. It was time for another gel. I fished a Citrus flavored Clifshot from my pocket, squeezed some into my mouth and tried not to spit it out. It was gross; syrupy sweet with the consistency of molasses. After finally swallowing it and washing it down with water I managed one more squeeze of it. I carried the packet in my hand for the next 2 miles, trying to work up the courage to finish the damn thing. I couldn’t do it and put the half-full pouch away for later. It occurred to me that I could try another flavor, but that seemed ridiculous when this one was already open. I kept sipping from my hydration pack, trying to wash the taste from my mouth. My lips and hands were sticky now, as well as the tube of the hydration pack. Suddenly I was not impressed with my current state of affairs, but doggedly refused to slow down or stop to improve my situation. The trail closed in again and followed the ridgeline of the rock for several miles. I was alone now; no one was immediately ahead of me and the sound of other runners had disappeared behind me. I had the entire landscape to myself and reveled in how small I felt next to rocks that were hundreds of millennia old. At mile 17 I looked up to see three male hikers; one was sitting on the rock ledge in the shade with a huge pack of some sort on his front. The other two were standing next to him wearing full backcountry packs; one held a water bottle and poured it into the sitting man’s mouth. This registered briefly in my mind as I ran within inches of them; they smiled at me but none of us spoke. I knew that the trail was open to hikers and cyclists and figured that they were out on their own adventure. I pulled into the last Aid Station at mile 19. Dana and Tina were there and cheered royally, just like last time. I didn’t even think to stop and refill my water bladder; it felt like there was enough left to make it another 10k. Time to hit the hill. And hit it I did. My pace had already slowed to 10:15/mile average, and I was readjusting my time goal. Now I wanted to finish by 4:20. The terrain was taking a toll on my glutes, though my feet were still totally fine. Directly out of the Aid Station the jeep trail went UP. The two people in front of me were walking and I decided to do the same. My pace slowed even further into the 13:00/mile range, as I interspersed walking the hills with running whenever I could. At the top of the hill the trail turned south and we followed another ridgeline, heading up for another mile. After two miles at a 13-minute pace I caught up to a few runners. One guy had taken off his shirt and the effects of the Colorado sunshine were already apparent on his skin. 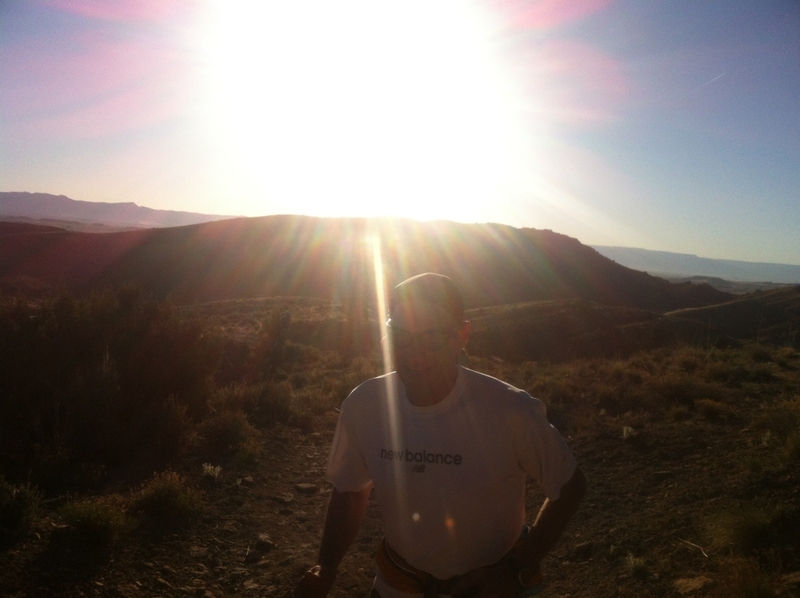 I picked up the pace as soon as the terrain leveled out and started to run again. No time to slow down, had to keep going. My friend Jeff kept popping into my head, and I had mental conversations with him, telling him about the terrain, the power walking, how I didn’t spend any time in Aid Stations, how my feet were fine and I was still running. Finally the terrain shifted again and instead of going UP, I was going DOWN. Quickly. The trail was boulder-infested single track next to high rock walls. I was starting to get tired, and my legs didn’t have the same pep. At mile 23 it occurred to me that I hadn’t had any fuel for about 10 miles. That half-eaten gel was still in my pack. It was time to force feed myself and get out of the bonk. At a moderately clear place on the trail, where I didn’t have to use my hands to ease down through the rock crevices, I pulled out the gel and ate the disgusting thing, washing it down with water. There. That should do it until the finish line, only two more miles to go. Almost there. It was a lovely thought, but I had to get off the rocks before I could do any anchoring. A few more twists and turns, and finally I was down. Less than half a mile to go, almost there. My 10:00/mile pace had blown up to 10:39. My only hope of salvaging anything was to bust out the last few minutes as fast as I could. A minute later the Garmin clicked over to Mile 25. I heard the little chiming noise, looked briefly at the watch, and let out a big, fat, F-Bomb. The finish line was not close. I wasn’t there yet. The course was long. I picked up the pace and ran steadily along the jeep trail that had started the whole thing. I stopped thinking and just ran. Nothing to do but run. Not there yet… keep going. Bring it home. The finish line in sight, I pushed through and remembered to look at the clock; 4:36. My Garmin read 25.9 miles and I ruefully said that the organizers should have called this race a marathon and been done with it. Dana stood cheering and had beverage in my hand within seconds, then a refill and M&M’s. I stood in the sun and looked over the crowd; two of my friends that were racing had already come in; I was third, and Jesse was somewhere behind me. I was upset with myself for blowing the 4:10 pace I had set at the outset of the race, and couldn’t find any joy in coming in at 4:36, well on the low side of the 30-minute range Jeff and I had discussed. I was too tired to think of anything I would/could have done differently; all I knew was that I had left it all out on the course. I had done the best I could. I grabbed a plain hamburger patty, slathered it with relish and ketchup and wrapped it in lettuce. My friends laughed to watch me eat; apparently I was loving on the food and wore a good amount as I took huge, happy bites. About an hour and a half later I slowly walked to my car and changed out of my shoes into flip-flops. I ate the other half of my bagel with more almond butter and drank a single-serve container of Chocolate Almond milk while I considered my shower options in town. I knew what he was saying and smiled through my tears. If I had given it my all, that was good enough. That’s all anybody can do and that’s all that he, or anyone with a pulse, can ever hope for. I had run my hardest and did the best I could. It took a good 12 hours for the thought to cross my mind that my lack of fuel might have had something to do with my slow pace. All I knew at the time was that I couldn’t choke down another sticky/sweet gel. This is good information going into my next race, where I will work on getting calories in a liquid format. Approximately 175 (unofficial count) finished the 25-mile trail race. The racecourse was absolutely beautiful. 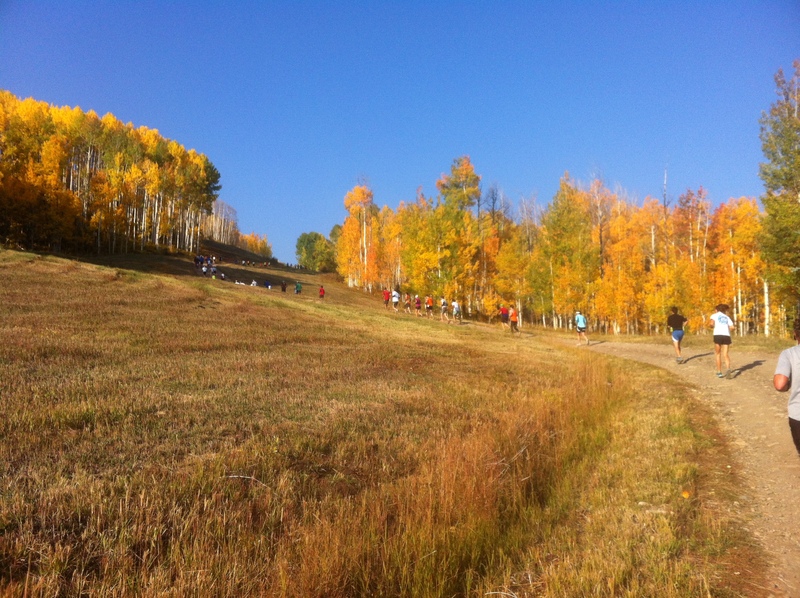 The weather was incredible and the runners were a fabulous group of quality individuals. I wish there was gluten-free food at the post-race tent, or some shade, though that didn’t seem to matter much at the time. Also, a finisher medal would have been nice. The race director broke the age groups into three categories per gender; 0-34, 35-50, and 50+. It was bizarre to think that I was racing against people across a 15-year age range. I ranked 5th in my Age Group for women, and came in 55th overall. but I have been through three aid stations with no water, the 50 mile turn around had no water, (one aid staion had no water but lots of peanut butter),the start had no water….and best of all…no one seemed to care. I had to run to my car about a mile down the road to fill up with water at the 50 mile turn around. 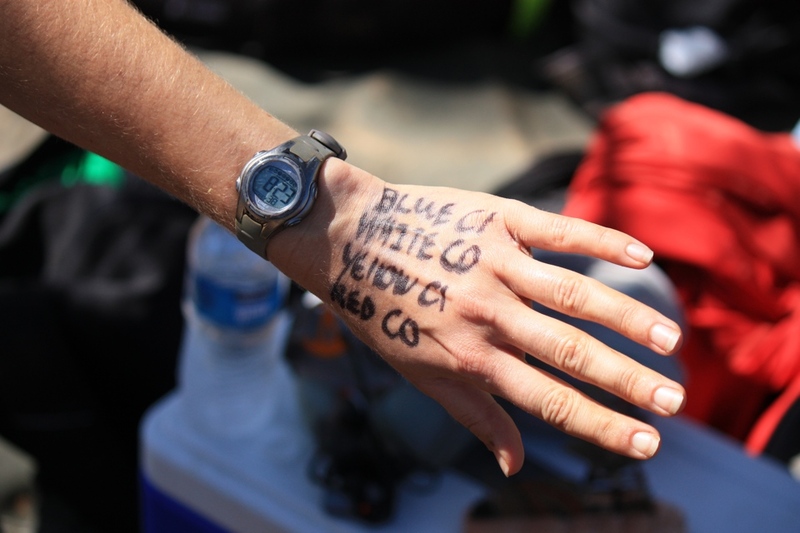 I could have written that exact race report – down to the time I wanted and the time I got – as well as the swear words when I looked down at 25 and was still out on the course. I kept reminding myself that trail races aren’t ever ‘certified’ at the distance they advertise, but it still didn’t help me from feeling they needed to bring the finish line to me at mile 25. 🙂 Great job! You did good and Keep It up! I have had sames experiences, not liking my time, not eating enough food,etc. No matter how prepared I am there is always a surprise that is why to me every race is unique. Thanks Yami. I think overall it was a good race… within 24 hours I was mortified at myself for the food thing. But, it’s all learning, right? Countdown to the Marathon on May 6, I’ll do it again and try to do better!